We managed to get a quick catch-up with Luis Garcia on Saturday, and it was fantastic to see the Spanish magician back at Anfield. He was in great spirits before, during and after the game – and in-between hoards of fans grabbing photos with the pint-sized Spaniard – he answered a few of our questions. Who’s the three best players you’ve played with…? It’s difficult to say, but I’ll go with Ronaldinho, Carles Puyol and maybe Jamie Carragher! Jamie was amazing.. a real man and a great defender. What’s the best goal you’ve ever seen a Liverpool player score? Easy! Steven Gerrard against Olympiakos. Oh my God… I didn’t play the game but we needed a goal to qualify. We were very bad all match and then Stevie comes up the strike. Amazing. It was a dream. 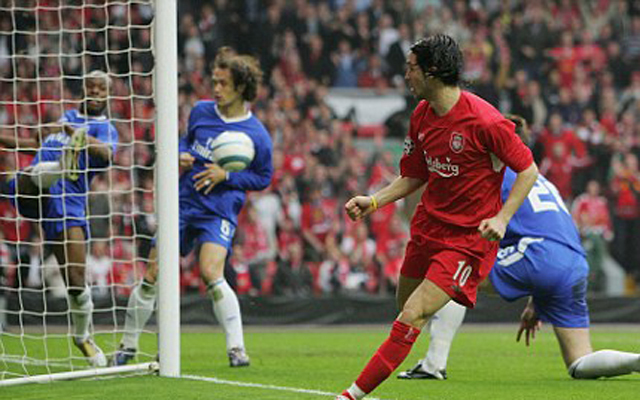 So.. you know what’s coming next.. Did it cross the line (referring to his Chelsea effort in that season’s semi-final)? Haha.. Of course it did. Everybody who supports Liverpool knows it crossed the line. I don’t know what’s wrong with the rest of them! Garcia only stayed with Liverpool for three seasons, but he established himself a fans’ favourite due to his penchant for brilliant goals and the manner in which he fell in love with the city. His ‘Luis Garcia, he drinks Sangria’ song is still one of the best supporters have come up with in recent memory, and when you see how diminutive he is at first-hand, his on-pitch ability becomes all the more impressive.